​​​​Ahh, Chicago. “City of the Big Shoulders... Hog Butcher for the World.” After more than a century is Carl Sandburg’s assessment of the city still accurate? Quite frankly, we don’t know, but you would have to figure there are at least some great knives sets in town. Sandburg would have been 52 when Chicago Cutlery was established in 1935, though he would have been long passed when the company claimed to have “the world’s most responsive cutlery,” which doesn’t have the same ring to it that “hog butcher [knife] of the world” does. Nevertheless, the company does offer some pretty sweet-looking black-oxide and stainless steel knife sets as a part of their new Responsive Touch Technology series, a line of knives that forms to the user's grip and is backed by a Lifetime Guarantee. Chicago Cutlery’s bread and butter as a knife company has always been in there knife sets, of which there are many. But how does one go about whittling down the lists to what is good and what is not so good? The answer is easy. Just follow us as we rate knife sets for families, expert chefs, novice chefs, knife newbies, budget sets, first home buyers, and everything in between. We will run through as many knife sets as we can here, but, that will, in all probability, only represent the tip of the iceberg. Not to worry, tough, as we promise to provide interesting, useful, and entertaining information along the way. So let’s get started with our Chicago Cutlery reviews of best knife sets. An 8" slicer, 8" Che’fs knife, kitchen shears and eight 4-1/2" steak knives round out the usual knife set suspects, and the included sharpener works well. The blades stay sharp and make short work of kitchen duties, light and heavy. Another 18-piece knife set that we liked a lot is the Chicago Cutlery Fusion-Forged Block Set, which has a rating of 5.5 by 1,572 reviewers. The knives are made out of durable high-carbon stainless steel and are forged for incredible sharpness. 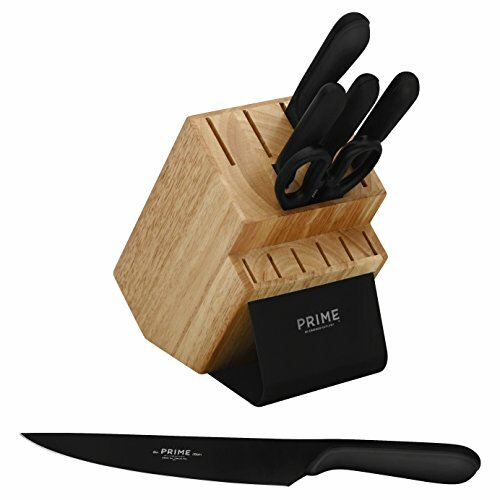 The addition of the shears and a bamboo cutting board make this a complete knife set, indeed, a great-looking set in anyone’s home. This set even adds Chicago Cutlery’s own exciting new Partoku knife, which is a sort of cross between a Japanese Chef's knife and a paring knife. This unique little knife can do everything a parer can, but it can also stand in as a utility knife if need be. 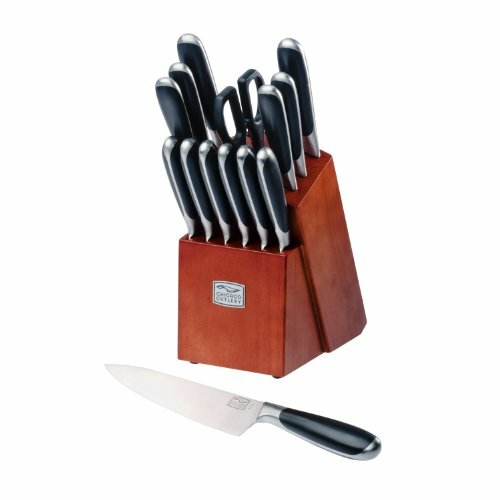 By far the most budget-friendly set that we are featuring on the blog is the Chicago Cutlery Belmont 16-Piece Block Knife Set. 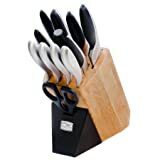 First home buyers, renters, and college kids will love this set, as it has all of the necessary knives one needs for a small starter kitchen, and it boasts blades made of forged stainless steel. As an added value, other items include are kitchen shears, a sharpening tool, and the attractive knife block itself. While the knife handle is not supple and rubbery as we may be used to with Chicago Cutlery products it is still no-slip, and the Belmont set, all in all, is a great entry-level, everyday knife set that is worth than the money you will pay for it. 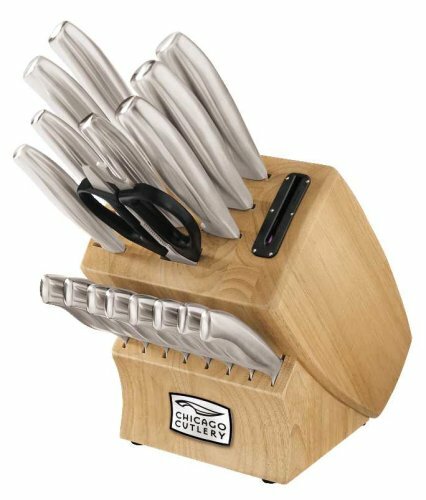 The Chicago Cutlery DesignPro 16-Piece Block Knife Set includes a wooden knife block and a sharpening tool, in addition to forged Japanese high carbon stainless steel blades that retain their sharpness over time. Also included are a unique bolster and an innovative no-slip grip for the ultimate control in cutting, chopping, and slicing. Each of the 13 knives is listed below and come with a full Lifetime Warranty. For around $ and a four-and-a-half stars rating for 51 reviews, you’ll get Japanese high-quality stainless steel and a whole lot more. 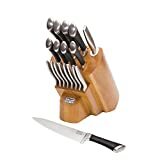 The Chicago Cutlery Elston 16-Piece Block Set may be the best starter home knife set we have seen in a long time, and, at around $, it also gets the Amazon’s Choice Award and our Chicago Cutlery reviews. This full-metal stainless steel high-carbon stainless design feature metal blades and handles, in a unibody design that is sleek, professional looking, and sanitary. Plus, the forged steel gives each knife a nice weight and balance, with full tang and Taper Grind edge Technology. The set includes the following blades backed by a lifetime warranty. Now, before we continue with our list, let’s examine some essential element of steel and what high-quality steel actually means. By now, you ought to have heard of Carbon (C), which, when added to iron, increases the hardness and edge retention of steel blades. But, another common element used in knife-making is Chromium (Cr), which, when combined with Nickel (Ni) and added to steel in amounts of up to 13 percent, gets you a shiny, rust and stain resistant finish. Both Carbon and Chromium promote the formation of carbides. Carbides are extremely hard bits that form as metal is cooling and can be notoriously hard to sharpen. Keeping in mind that traditionally steel would be made from either one or the other element - carbon or chromium - knife makers have now begun to combine them to create high carbon stainless steels. Apart from increasing hardness and decreasing staining, Molybdenum (Mo) is a chemical element that promotes wear resistance in cutlery and helps to protect the blade against chips and dings or other damage that is caused by sudden, hard impacts. Cobalt (Co), on the other hand, is a rapid hardener which does not promote carbide formation but speeds up the metallurgy process to a point where it is difficult to control. And Tungsten (W) helps to improve tensile strength and wear resistance against pitting and tearing. Other elements used less frequently in knife-making include Aluminium (Al), Boron (B), Lead (Pb), Copper (Cu) Nitrogen (N), Phosphorous (P), Manganese (Mn), Vanadium (V), and Silicon (Si). For a complete list of metal additives, please see this informative website. So let’s continue with our review of Chicago Cutlery reviews of knife blocks and see if we can’t spot some more useful knife-making terms and information along the way. Chicago Cutlery Beldon 16pc Block Set offers blades are high carbon stainless steel and triple-riveted polymer handles. Plus, the knives come with a full lifetime warranty, full metal tang, and Taper Grind edge technology for optimum sharpness. 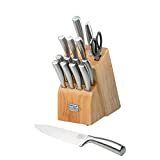 The cherry wood knife block, alone, is worth staring at, but the knives, too, are attractive stainless steel with black polymer handles. And, at just over $, this might be our favorite budget set. And, finally, what would a knife review be without some fine cuts? Well, the new Chicago Cutlery Prime line of knives might be taking a page out of Sandburg’s book after all, as it takes it is named after USDA’s premier grade for beef as an indication of its exceptional quality. Engineered for excellent weight and balance these knives feature patent-pending ergonomic handles that respond to your grip and 5CR15Mov German stainless steel for extra hardness and a corrosion-resistant, e5asy-to-sharpen edge. Plus the black-oxide finishes not to chip and looks really cool. What more can we say about a company that has run the gamut of kitchen knife sets, from sets for new home buyers and novice chefs to sets for families and professional cooks? It seems there is no a demographic out there that Chicago Cutlery does not market to. And, now, they have even entered the high-end game, too. And that is not a bad place to be, as, while you can easily purchase individual knives, buying a knife set can save you a ton of dough. 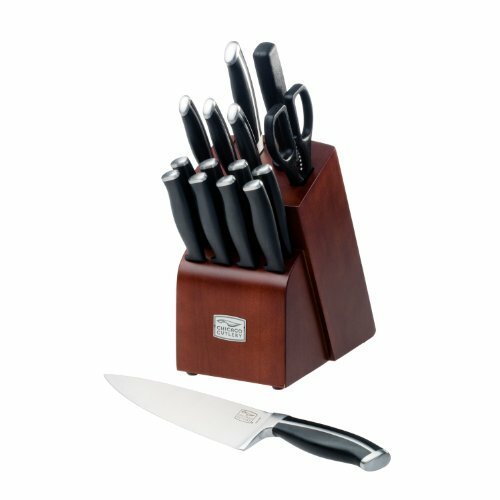 Knife sets are attractive to people because of all of the perceived value in a knife set. And some of that value may even add up, as buying three quality knives, in some cases, costs more than buying a complete set of knives. In our opinion, though, if you do opt for a knife set, try to weed out the set overwrought with meaningless pieces. A good quality chef’s knife, utility knife, paring knife, and a few steak knives are all that you need unless you have a large family with multiple chefs. A small knife block set is perfect in most cases and we really like The Chicago Cutlery DesignPro 13-piece Block Set and the Belden for this reason. The knives are high-quality and your block doesn’t get plugged up with unnecessary tools. However, we also like the Prime 7-piece set for the same reason. While it may be pricey, it is chock full of extremely high-quality steel knives and, in our opinion, that might be worth every penny in the end. Plus, the black oxide finish, if we haven't said it, is really cool. Would you expect anything less from the “hog butcher [knife ] for the world”?